Fig. 1. Aiching semi crater in the Inn river bank vis-à-vis the town of Marktl (UTM coordinates 338863, 5346952). 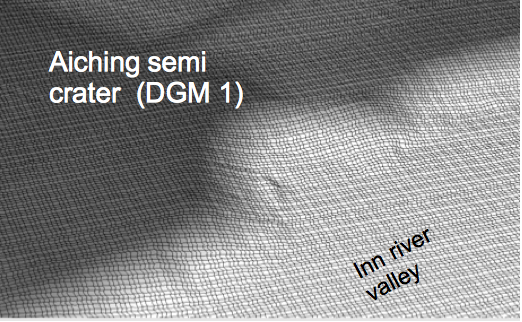 Digital Terrain Model. While the erosion of the Inn river has exposed a very coarse section of the crater in the past, a gravel extraction, certainly unintended, has recently made an exceptionally fantastic cut through the crater rim with a ring wall (Figs. 2, 3). Fig. 2. The recently produced outcrop in the northwesterly part of the ring wall. Fig. 3. The crater rim in detail revealing a structure as a combination of type “Barringer crater” and type “Odessa crater”. As it is to be assumed that further gravel extraction will take place, the current outcrop conditions may be further preserved and even improved but also completely destroyed. In the latter case we provide the reader with the opportunity to look at this beautiful textbook example of the impact crater formation. Improved outcrop conditions provided we plan to write a complete article about this nice crater approachable. 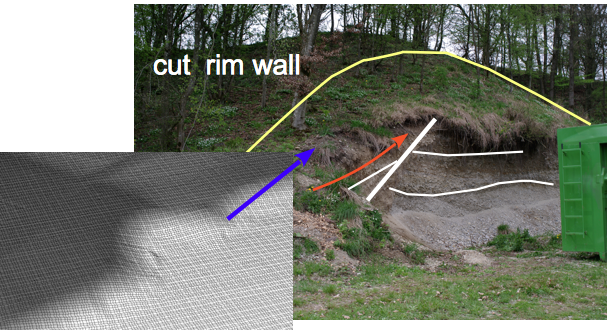 For more information on the Aiching semi crater as an example for Digital Terrain Model applications click HERE.